DuPont BulletProof Sealer gives your natural stone, including marble, granite, limestone, bluestone, Saltillo, travertine and sandstone, exceptional protection against most stains and arms it with a solution that makes cleaning stone easier. The water-based, low-solids coating features DuPont's advanced penetrating microbond protection for superior stain protection while preserving the stone's natural look. 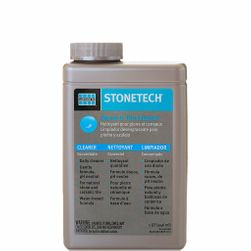 This 1-quart container of DuPont Stone Sealer is suited for the most porous stone surfaces, including honed or textured stone. 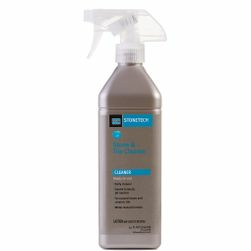 Use this product as your preferred DuPont granite sealer or marble sealer in interior and exterior environments. You can expect three to five years of wear on interior surfaces and one to three years of wear on exterior surfaces. Each 1-quart container of sealer will cover 15 to 100 square feet, depending on the porosity of the stone surface. Directions for Use: Read entire product label prior to use. Always test in a small inconspicuous area with a 24-hour cure time to determine ease of application and desired results. Allow sealer to penetrate the surface for 15-30 minutes. During this time, distribute sealer over entire area to ensure even penetration. Remove excess sealer by wiping entire surface thoroughly with clean, dry towels. A second coat may be needed for porous, absorbent surfaces and should be applied 30-40 minutes after initial application as directed in steps 2-3. 15-30 minutes after final application, wipe entire surface with clean dry towels to remove any excess sealer. To remove residue, reapply a thin coat of sealer, allow to dwell for 2-3 minutes, agitate with a white nylon pad and dry thoroughly with clean, dry towels. A full cure is achieved after 24-72 hours; foot traffic may begin in 6-8 hours. If foot traffic must resume sooner, cover the floor with red rosin paper to protect it until full cure has been achieved. 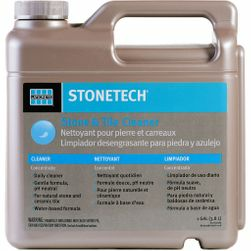 Allow new grout installations to cure for a minimum of 72 hours prior to application. Make sure surface is clean and free of waxes and coatings prior to application. Surface temperature should be between 50°F and 80°F. Ensure that the area is well-ventilated during application and until the surface is dry. Coverage: Quart: 15-100 sq ft depending on porosity of the stone surface. Expected Wear: 3-5 years on interior surfaces & 1-3 years on exterior surfaces. 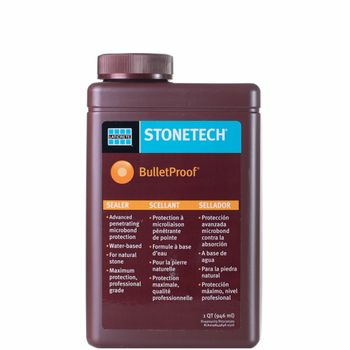 DuPont StoneTech BulletProof Sealer data sheet for content safety information. 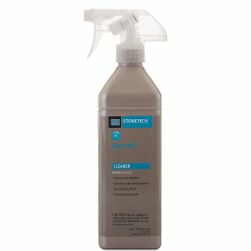 Additional Information: Clean surface as needed with Revitalizer® Cleaner & Protector or Stone & Tile Cleaner.